Dead batteries tend to pop up at the worst times. There's never a right time for your car's battery to fail. Whether you're on your way to work, off to the airport, or just cruising around town, the dreaded *click* of a dead battery is the absolute last thing you want to hear. And while there are many possible culprits for a vehicle's refusal to fire up -- the starter motor, alternator, and spark plugs among them -- it's very likely your battery is behind the problem. Thankfully, narrowing down the problem is very simple. Before we get into jumping, charging, and replacing your battery, let's cover how to diagnose your battery issues. If your vehicle won't start, cranks slowly, displays a "check battery" indicator, or has dimming lights, you have symptoms of poor battery health. Here's how to test it. Purchase a multimeter. These measure the voltage of your car's battery and can be bought online or found cheaply at local auto parts stores. Find your battery. Most vehicles store their batteries under the hood, either to the left or right of the engine. However, certain manufacturers place batteries in the trunk, under the floor, or under the rear seats, so check your owner's manual to confirm its location. You can identify the battery by the positive and negative terminals, which have red /+ markers and black /- markers on them, respectively. Test. Turn your vehicle off and set your multimeter to read DC volts. Attach its black lead to the negative terminal, and the red lead to the positive terminal. Diagnose. A healthy car battery will read 12.45 volts or higher, so if your multimeter displays that or above, you're in good shape. If you're below 12.45 volts (a 75 percent charge), you may need to consider charging or replacing the battery. Depending on the severity of your problem, your battery might just need a solid top-off rather than a full replacement. Try this option first, either by getting a jump start and driving the vehicle for 20 minutes -- your alternator will charge the battery as you drive -- or hooking the battery up to a charger. If your battery fails to hold a charge repeatedly, though, you'll probably need to swap it out. Let's cover charging first. Purchase jumper cables. Look for a length of at least 10 feet. Longer cables allow you more flexibility in case you can't park directly next to the car that needs jumping, such as in a crowded parking garage. Find a power source. This is typically another vehicle, but portable jump starters that connect directly to your battery are available. Connect the cables. Make sure both vehicles are off and will not roll, open the hoods, and connect the cables. Connect one red clamp to the positive terminal of the dead battery, and connect the other to the positive terminal of the live battery. After, connect one black clamp to the negative terminal of the live battery, and connect the other to a bare, unpainted metal surface under the hood. Start the functioning car, then the dead car. If the jump proves successful, leave it running and disconnect the cables. Remember not to let the red and black clamps touch, because once electricity starts to flow, it can create sparks or possibly a short circuit. Keep the car running for 20 minutes to recharge the battery. Connect the cables. Attach the red clamp to the positive terminal, and the black clamp to the negative terminal. Turn on the charger and wait. Depending on the charger, rejuvenating your battery could take several hours. Disconnect the terminals. Make sure the keys are out of the ignition, and use a wrench to loosen the terminal bolts, starting with the negative. Most cars use 10mm bolts, but check your owner's manual or troubleshoot it with your wrench set. Not that many terminals are underneath plastic covers that will need to be moved. Also, never create a circuit between the two terminals or the positive terminal and metal with your wrench. This will conduct electricity and possibly create sparks. Pull the terminals up to remove them from the battery. Remove the battery hold-down, if there is one. Remove the battery. Use caution as batteries can weigh as much as 20 pounds. Clean the battery terminals. If you see white, gray, or green-colored buildup around your battery terminals, clean them off before installing a new battery to maintain a stable connection. Use fine sandpaper or emery cloth for this. Install the new battery. Reverse the previous process, installing the new battery, clamping it with the hold-down, and connecting the positive terminal, then the negative terminal. You're good to go! 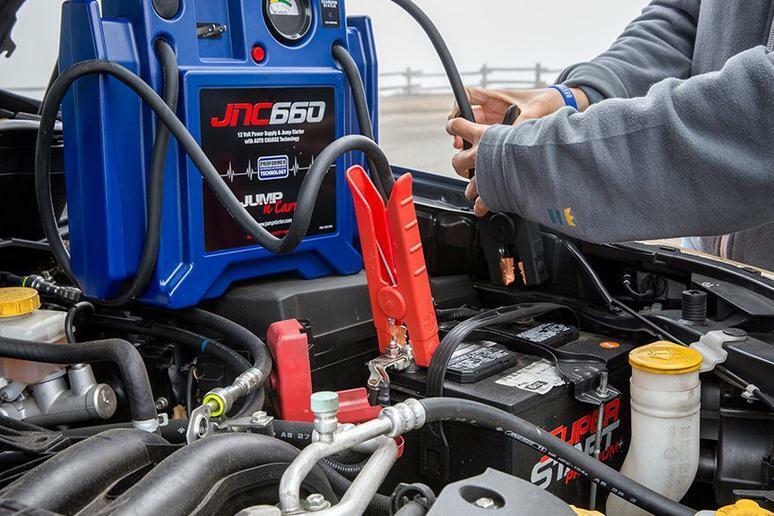 Here's everything you need to diagnose, charge, jump, or replace your battery. A multimeter: These measure the voltage of your car's battery, and can be found in digital and analog versions. We recommend spending a bit more for the digital version for higher accuracy. Jumper cables: These facilitate the flow of power from one vehicle's battery to another. A battery charger: These can charge your battery over several hours, and often come with adapters for all types of batteries. A portable jump starter: These will pay for themselves if you don't have access to a trickle charger, don't have the time to use it, or you can't find another vehicle for a traditional jump. A wrench set: 10mm is the typical size for battery terminals, but it can vary. Having a diverse set of wrenches will come in handy for this job and a thousand others.